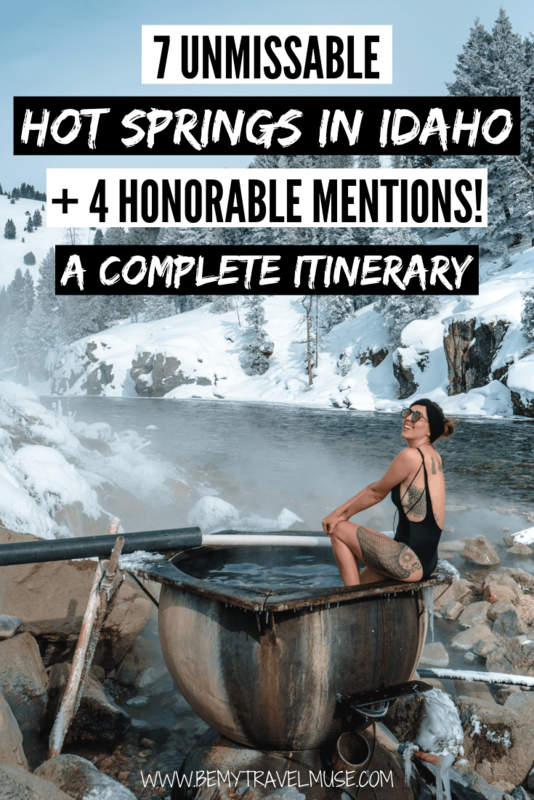 I have a secret that only locals and a few well-informed tourists know: Idaho is stunning and chock full of enchanting hot springs. After soaking in the hot springs in Sun Valley a couple of years ago I vowed to return and see more of a snowy Idaho and its numerous springs, of which there are an estimated 100+. I had to know which were the best. I am an enthusiast, after all. I began my trip in Boise, which has a hip downtown area with great food and numerous options to overnight if you need to. From there it’s a stunning drive to Idaho City, which would be my first hot spring of the trip. This spring is one of only two on this list that is more of a spa rather than a natural, free of charge spring. To have the private tub pictured above, complete with server for drinks and snacks, you’ll need to book ahead of time and pay $45 per hour. You can also access the larger warm pool, steam bath, and jacuzzi for $20 per person for an all-day pass, or if you’re staying at the Inn like I did, $8 per person. I enjoyed this spring and can see why it’s worth spending a day there ordering food and drinks, with access to a warm changing room with showers and even massages. It’s also easy to access if in snowy conditions, whereas the other springs on this list are more remote. I came to find on this trip that I prefer the ‘primitive’ or natural springs, not only because they’re free, but it’s just more my style. Still, this is a great spring to break up the drive between Boise and Stanley. Stay: The Inn is a great value and gives you cheaper access to the springs. I’m not sure how many options there are in Idaho City (‘city’ being a loose term for a town of 500 or so people), and thought the Inn was great. Eat: Trudy’s Kitchen has a nice offering and again, with very limited options, you can find some healthy food there, and pie! This is in my top three favorite hot springs for variety, heat, and views! I understand that these are ordinarily quite popular but I did have them all to myself for a brief period of time in the winter. The access road and campgrounds will be closed in the winter, but there’s a pull-off with some parking and you’ll see clear footprints in the snow to the springs. You’ll come to a couple of pools before reaching the Payette River. Stop in these before or after. They don’t have the views but they’re the biggest and I loved them just the same. Next, walk down some steps to the river and you’ll see the steaming waterfalls. This part is awesome but you haven’t seen it all yet! It’s your call if you want to put on shoes for the last pool – it’s a sharp and sometimes slippery and jagged walk. I went barefoot because I think shoes are foot prison and found a shallow, super warm pool with the million dollar view as a reward for my efforts. BOOM. Check out that view! From Kirkham, continue on the 21 to Stanley. You’ll also pass a roadside pull-off for the Bonneville Hot Springs which I didn’t get a chance to soak in though they came highly recommended. I certainly would have if there had been more time in the day but for some reason on this trip I was sleeping 10-11 hours per night and getting leisurely starts to the day, which was just fine with me! These springs are the only others on this list that aren’t primitive springs, though they’re fed by a natural spring. After seeing photos I had to experience them with those rustic barn doors and seriously stunning views of the Sawtooth Mountains. I genuinely wonder if there’s a town that can rival Stanley in terms of winter wonderland quaintness. You can visit these springs for free if you stay at the hotel, and you might as well, since it’s cheap and next to one of the best restaurants in town. That said, you’ll have to share with up to 7 other people, which is likely to be the case if you go at sunset or golden hour, which are popular times. It can be fun or annoying depending on who you get in there with you. Stanley is a popular snowmobiling destination, and you can rent snowmobiles and self-guide or take guided tours. I was there strictly to soak and didn’t partake but word on the street is rentals are around $200/day (9AM-4PM). Eat: Mountain Village Restaurant has nice breakfast and some vegan options. There’s also a decent pizza place. The whole town is under 100 residents so you won’t have a ton to choose from, though more is open in the summer. Just 5 minutes out of Stanley you’ll see the famous Boat Box Hot Springs. It’s a metal tub right on the river that’s easy to access from the road and free to use. This spring wins the award for most unique. It looks like a witch’s cauldron! That said, there’s only room for a couple of people at a time, maximum four if you really like each other. It’s a popular spring so expect to wait for your turn! The pull-off only has room for 2-3 cars which helps. I waited about 45 minutes for my turn and kindly asked the next car that pulled up to do the same. It’s worth it for the experience but don’t expect to be able to soak for hours undisturbed in Boat Box. This one is up there with Kirkham as one of my favorites, probably because it’s the only spring on this list that I had totally to myself. The single pool is super warm and it’s right on the river, plus there are several perfectly situated rocks to lounge up against. The water flows through nicely as well so the algae is minimal. When I was there it was a dreamy winter wonderland that, even though it’s right off the road, felt secluded. There’s the pool to the right that I went to, and a little tub to the left that reminded me of a less photogenic Boat Box. It was impossible for me to leave the natural pool once I got in so I’ll have to leave that tub for another time. This one is only 10 minutes beyond Boat Box so if it looks crowded on the first pass-by, know that you can hit Sunbeam and return on your way back to Stanley. I stayed in town for 2 nights before venturing onwards in order to have a full day in Stanley. This is probably Idaho’s most famous hot springs and also amongst the most popular. This surprised me since it’s a 2-mile hike in and is located in the middle of nowhere, but the views make it obvious why. I was a bit disappointed when I pulled up and saw 10 other cars in the lot, which I later learned is a slow day! However, there are numerous pools at the top of varying temperatures from perfectly warm to about as hot as it can be without being too hot. The trail up is easy to follow and not very difficult. It’s only steep in the beginning and at the end and not for very long. I didn’t personally feel that snowshoes were necessary but sure wish I’d brought spikes or Yaktrax as the trail was super icy in some places. It was pretty sketchy, to be honest, so bring some when you go if it’s the winter! I heard that come March, it’s a lot more likely to share these springs with tons of people. That said, it was a fun atmosphere and clothing is optional at these springs, which ought to make the nudists happy! Stay: From here you can head north to Salmon to see a couple more springs or stay in a town on the way back out to Twin Falls, which is where I ended my trip. I overnighted in Arco due to darkness and road conditions and can only say options for food are severely limited. However, I just loved the owner of this motel and thought it was fine for the night. The price was right too at $59! From Goldbug, you can backtrack to Sun Valley via Stanley or head to Sun Valley directly from Stanley. If you’re mainly after awesome hot springs you would have already seen better ones elsewhere. This one in Sun Valley has a lot of hot and cold and not too much comfortably in between pools. However, Sun Valley is a fantastic ski and snowmobile destination, not to mention an awesome town with friendly people. Check out the Frenchman’s Bend Hot Springs as well, which I heard mixed reviews about, on your way south. Apparently Idaho’s most famous and popular hot springs, Jerry Johnson is north of Salmon, accessible if you keep going up from Goldbug. It’s a short, 2.6 mile round trip hike to get to the springs which get rave reviews on Yelp. There are three soaking pools. Not to be confused with Stanley, Idaho. If you keep going on the 12 you can reach these hot springs, provided you’re willing to do a 9.3-mile roundtrip hike. It sounds like an adventure with a worthy terminus to me. Back towards Boise, if you head north on the 55 and take the Banks Lowman Road exit, you’ll be able to reach this hot spring after fording a river. Given this, it’s not the best winter hot spring, but the cascading pools look quite magnificent for a spring or fall trip. If you head north, you’ll find these hot springs off the NF-22. For some reason on Google Maps they’re labeled Samuel’s Hotsprings. This is a popular one and is known for perfect temperatures and easy accessibility. If you’re going in the winter months like I did, take a car with 4 wheel drive and ideally some chains. As storms come through, the roads between these springs can close or become icy and snowy. The Idaho Transportation Department is a great resource and is constantly updated. Alternatively, dial #511 for road updates. Signal is hard to come by in these remote areas so check conditions before you start driving. There’s no easy way to transition from nice, warm springs to getting the heck out of your suit as quickly as possible and into dry clothes. It was well below freezing when I was there and was often snowing. For the most part, I had privacy to change (not that I particularly care – most of the natural springs are clothing optional as well) and waited until I was super warm in the springs to make the transition. To make it easier, bring a nice, dry towel and keep it in a dry bag until the time comes, or maybe even a bathrobe. If you’re in freezing temperatures, keep your hair dry unless you can immediately jump into a warm car, meaning don’t dunk at Goldbug. I recommend always filling up before you get down to a quarter tank. Most of the towns on this route are under 100 people, and facilities, as well as cell signal, are limited. The same goes for snacks. Go shopping in Boise or Twin Falls, wherever you start, rather than counting on finding healthy snacks along the way. It’s not impossible, it’s just fewer and farther between. I loved how cheap this trip turned out to be! In the warmer months, it could be even cheaper if you camp along the way. Gas and lodging were great values in my opinion. It came out to about $100 per person per day including gas, food, and lodging. I can’t even get accommodation for that in California! While these are the best springs in Idaho, I imagine there are even more in California, Nevada, and Wyoming and my thirst is only whetted. Stay tuned for more posts like this in the future because Pandora’s box has been opened. What are some of your favorite hot springs? What did I miss?